The Himalayas (also Himalaya, IPA: [hɪ'mɑlijə], [ˌhɪmə'leɪjə]) are a mountain range in Asia, separating the Indian subcontinent from the Tibetan Plateau. By extension, Himalayas is also the name of the massive mountain system which includes the Himalaya proper, the Karakoram, the Hindu Kush, and a host of minor ranges extending from the Pamir Knot. The name "Himalaya" means "the abode of snow" in Sanskrit. The Himalaya mountain range is the highest on earth and is often referred to culturally as the "roof of the world." The range is home to the world's highest peaks: the Eight-thousanders (peaks over 8,000 meters above sea level), including Mount Everest. Today mountaineers come from all over the world to scale Mount Everest. The Himalayas stretch across six nations: Bhutan, China, India, Nepal, Pakistan, and Afghanistan. It is the source of three of the world's major river systems: the Indus Basin, the Ganga-Brahmaputra Basin and the Yangtze Basin. An estimated 750 million people live in the watershed area of the Himalayan rivers. The Himalayas (also Himalaya, IPA: [hɪ'mɑlijə], [ˌhɪmə'leɪjə]) are a mountain range in Asia, separating the Indian subcontinent from the Tibetan Plateau. By extension, Himalayas is also the name of the massive mountain system which includes the Himalaya proper, the Karakoram, the Hindu Kush, and a host of minor ranges extending from the Pamir Knot. The name is from Sanskrit himālaya, a tatpurusa compound meaning "the abode of snow" (from hima "snow," and ālaya "abode"). Together, the Himalaya mountain range is the highest on earth and is often referred to culturally as the "roof of the world." The range is home to the world's highest peaks: the Eight-thousanders (peaks over 8,000 meters above sea level), including Mount Everest. To comprehend the enormous scale of Himalayan peaks, consider that Aconcagua, in the Andes, at 22,841 feet (6,962 meters), is the highest peak outside the Himalaya, while the Himalayan system has over 100 separate mountains exceeding 23,622 feet (7,200 meters). The Himalayas stretch across six nations: Bhutan, China, India, Nepal, Pakistan and Afghanistan. It is the source of three of the world's major river systems: the Indus Basin, the Ganga-Brahmaputra Basin and the Yangtze Basin. An estimated 750 million people live in the watershed area of the Himalayan rivers. The Himalayas, geologically young and structurally old, stretch over the northern borders of India. These mountain ranges run in a west-east direction from the Indus to the Brahmaputra. The Himalayas represent the loftiest and one of the most rugged mountain barriers in the world. They form an arc, which covers a distance of about 1,491 miles (2,400 km). Their width varies from 248 miles (400 km) in Kashmir to 93 miles (150 km) in Arunachal Pradesh. The altitudinal variations are greater in the eastern half than those in the western half. The Himalayas consist of three parallel ranges in its longitudinal extent. A number of valleys lie between these ranges. 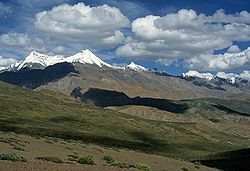 The northern-most range is known as the Great or Inner Himalayas or the 'Himadri'. The flora and fauna of the Himalayas varies with climate, rainfall, altitude, and soils. The climate ranges from tropical at the base of the mountains to permanent ice and snow at the highest elevations. The amount of yearly rainfall increases from west to east along the front of the range. This diversity of climate, altitude, rainfall and soil conditions generates a variety of distinct plant and animal communities, or ecoregions. Above the alluvial plain lies the Terai strip, a seasonally marshy zone of sand and clay soils. The Terai has higher rainfall than the plains, and the downward-rushing rivers of the Himalaya slow down and spread out in the flatter Terai zone, depositing fertile silt during the monsoon season and receding in the dry season. The Terai has a high water table due to groundwater percolating down from the adjacent Bhabhar zone. The central part of the Terai belt is occupied by the Terai-Duar savanna and grasslands, a mosaic of grasslands, savannas, deciduous and evergreen forests that includes some of the world's tallest grasslands. The grasslands of the Terai belt are home to the Indian Rhinoceros (Rhinoceros unicornis). Also called Churia Hills, these intermittent outermost range of foothills extend across the Himalayan region through Pakistan, India, Nepal and Bhutan. They consist of many sub-ranges with summits generally reaching 969 to 3,937 feet (600 to 1,200 meters) high. Steeper southern slopes form along a fault zone called the Main Frontal Thrust; while northern slopes are gentler. Permeable conglomerates and other rocks allow rainwater to percolate down into the Bhabhar and Terai, supporting only scrubby forests upslope. The Inner Terai or Dun Valleys are open valleys north of Siwalik Hills or nestled between Siwalik subranges. Examples include Dehra Dun in India and Chitwan in Nepal. The prominent ranges of the Mahabharat Lekh reach 6,562 feet to 9,843 feet (2,000 to 3,000 m) high, forming along the Main Boundary Thrust fault zone with a steep southern face and gentler northern slopes. They are nearly continuous except for river gorges. Rivers gather in candelabra form to the north to break through this range in relatively few places. The Midlands are a 'hilly' region averaging about 3,281 feet (1,000 m) immediately north of the Mahabharat Range, rising over about 62 miles (100 km), to about two miles (4 km) at the Main Frontal Thrust fault zone where the Greater Himalaya begin. Montane forests - At the middle elevations of the range, the subtropical forests yield to a belt of temperate broadleaf and mixed forests: with the Western Himalayan broadleaf forests at the western end of the range, and the Eastern Himalayan broadleaf forests in Assam and Arunachal Pradesh. Above the broadleaf forests are the Western Himalayan subalpine conifer forests and Eastern Himalayan subalpine conifer forests. Above the tree line are the Northwestern, Western, and Eastern Himalayan alpine shrub and meadows, which yield to tundra in the higher Himalayan range. The alpine meadows are the summer habitat of the endangered snow leopard (Uncia uncia). The 6,000 km plus journey of the India landmass (Indian Plate) before its collision with Asia (Eurasian Plate) about 40 to 50 million years ago. The Himalayas are among the youngest mountain ranges on the planet. According to the modern theory of plate tectonics, their formation is a result of a continental collision or orogeny along the convergent boundary between the Indo-Australian Plate and the Eurasian Plate. The collision began in the Upper Cretaceous period about 70 million years ago, when the north-moving Indo-Australian Plate, moving at about 5.91 inches/year (15 cm/year), collided with the Eurasian Plate. By about 50 million years ago this fast moving Indo-Australian plate had completely closed the Tethys Ocean, whose existence has been determined by sedimentary rocks settled on the ocean floor and the volcanoes that fringed its edges. Since these sediments were light, they crumpled into mountain ranges rather than sinking to the floor. 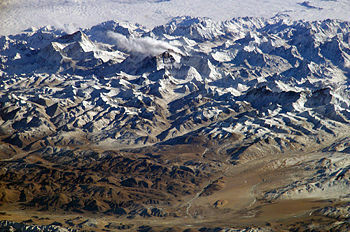 The Indo-Australian plate continues to be driven horizontally below the Tibetan plateau, which forces the plateau to move upwards. The Arakan Yoma highlands in Myanmar and the Andaman and Nicobar Islands in the Bay of Bengal were also formed as a result of this collision. The Indo-Australian plate is still moving at 2.64 inches/year (67 mm/year), and over the next ten million years it will travel about 1,500 km into Asia. About 0.79 inches/year (20 mm/year) of the India-Asia convergence is absorbed by thrusting along the Himalaya southern front. This leads to the Himalayas rising by about 0.2 inches/year (5 mm/year), making them geologically active. The movement of the Indian plate into the Asian plate also makes this region seismically active, leading to earthquakes from time to time. Glaciers near by K2 in Pakistan. The Himalayan range encompasses a very large number of glaciers, notably the Siachen Glacier, the largest in the world outside the polar region. Some other famous glaciers include the Gangotri and Yamunotri (Uttarakhand), Nubra, Biafo and Baltoro (Karakoram region), Zemu (Sikkim) and Khumbu glaciers (Mount Everest region). The western rivers combine into the Indus Basin, of which the Indus Riveris the largest. The Indus begins in Tibet at the confluence of Sengge and Gar rivers and flows southwest through Pakistan to the Arabian Sea. It is fed by the Jhelum, the Chenab, the Ravi, the Beas, and the Sutlej rivers, among others. Most of the other Himalayan rivers drain into the Ganga-Brahmaputra Basin. Its two main rivers are the Ganges and the Brahmaputra. The Ganga originates as the Bhagirathi from the Gangotri glacier and flows southeast through the plains of northern India, fed by the Alaknanda and the Yamuna among other tributaries. The Brahmaputra originates as the Tsangpo in western Tibet, and flows east through Tibet and west through the plains of Assam. The Ganga and the Brahmaputra meet in Bangladesh, and drain into the Bay of Bengal through the world's largest river delta. The Salween, Mekong, the Yangtze and the Huang He (Yellow River) all originate from parts of the Tibetan plateau that are geologically distinct from the Himalaya mountains, and are therefore not considered true Himalayan rivers. Some geologists refer to all the rivers collectively as the circum-Himalayan rivers. In recent years scientists have monitored a notable increase in the rate of glacier retreat across the region as a result of global climate change. Although the effect of this won't be known for many years, it potentially could mean disaster for the hundreds of thousands of people that rely on the glaciers to feed the rivers of northern India during the dry seasons. The Himalaya region is dotted with hundreds of lakes. Most lakes are found at altitudes of less than 16,404 feet (5,000 m), with the size of the lakes diminishing with altitude. The largest lake is the Pangong Tso, which is spread across the border between India and Tibet. It is situated at an altitude of 15,092 feet (4,600 m), and is 5 miles (8 km) wide and nearly 83 miles (134 km) long. A notable high (but not the highest) lake is the Gurudogmar in North Sikkim at an altitude of 16,890 feet (5,148 m). Other major lakes include the Tsongmo Lake, near the Indo-China border in Sikkim (India) and Tilicho Lake, a large lake in an area that was closed to outsiders until recently. The mountain lakes are known to geographers as tarns if they are caused by glacial activity. Tarns are found mostly in the upper reaches of the Himalaya, above 18,045 feet (5,500 m). For more information about these, see here. The Himalayas have a profound effect on the climate of the Indian subcontinent and the Tibetan plateau. It prevents frigid, dry Arctic winds from blowing south into the subcontinent, which keeps South Asia much warmer than corresponding temperate regions in the other continents. It also forms a barrier for the monsoon winds, keeping them from traveling northwards, and causing heavy rainfall in the Terai region. The Himalayas are also believed to play an important part in the formation of Central Asian deserts such as the Taklamakan and Gobi deserts. 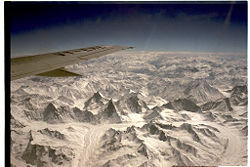 The mountain ranges also prevent western winter disturbances from Iran from traveling further, resulting in snow in Kashmir and rainfall for parts of Punjab and northern India. Despite being a barrier to the cold northerly winter winds, the Brahmaputra valley receives part of the frigid winds, thus lowering the temperature in the northeast Indian states and Bangladesh. These winds also cause the North East monsoon during this season for these parts. The weather phenomenon called Jet Stream affects our image of the highest peaks on earth. The strong stream of winds from the west, passes through Everest, creating a familiar plume of snow blowing from the summit that is visible from a great distance. The road from Srinagar in Kashmir via Leh to Tibet. This pass is now less used because of regional troubles. Many people are affected. Mohan Pass is the principal pass in the Siwalik Hills. The Himalayas, due to their large size and expanse, have been a natural barrier to the movement of people for tens of thousands of years. In particular, this has prevented the intermingling of people from the Indian subcontinent with people from China and Mongolia, causing significant differences in languages and customs between these regions. The Himalayas have also hindered trade routes and prevented military expeditions across its expanse. For instance, Genghis Khan could not expand his empire south of the Himalayas into the subcontinent. Chomolangma or Qomolangma -"Mother of the Universe" 8,850 29,028 1953 World's highest mountain, situated on the border of Nepal and Tibet, China. K2 Chogo Gangri 8,611 28,251 1954 World's 2nd highest. Located on border between Pakistan-administered Northern Areas and Xinjiang, China. One of world's toughest mountains to climb. Kangchenjunga Kangchen Dzö-nga, "Five Treasures of the Great Snow" 8,586 28,169 1955 World's 3rd highest, highest in India (Sikkim) and second highest in Nepal. Makalu - 8,462 27,765 1955 World's 5th highest situated in Nepal. Dhaulagiri White Mountain 8,167 26,764 1960 World's 7th highest situated in Nepal. Annapurna "Goddess of the Harvests" 8,091 26,545 1950 World's 10th highest situated in Nepal. In 1852, the Great Trigonometric Survey of India definitively identified Mount Everest, which until then had been an obscure Himalayan peak, as the world's highest mountain. Soon, reaching the summit of the "roof of the world" came to be viewed as the penultimate geographic feat. Attempts to climb Everest, however, did not begin until 1921, when the forbidden kingdom of Tibet first opened its borders to outsiders. On June 8, 1924, two members of a British expedition, George Mallory and Andrew Irvine, attempted the summit and disappeared in the clouds perpetually swirling around Everest. Mallory's body was not found until 75 years later, in May 1999. Over a period of 30 years, ten more expeditions failed to conquer Everest, and 13 climbers lost their lives. On May 29, 1953, Edmund Hillary, a New Zealand beekeeper, and Tenzing Norgay, an acclaimed Sherpa climber, became the first to reach the roof of the world, climbing from the Nepalese side. Hillary became a hero of the British Empire (the news reached London just in time for the coronation of Elizabeth II), and Tenzing was touted as a symbol of national pride by three separate nations: Nepal, Tibet, and India. The dangers of climbing Everest include avalanches, crevasses, winds up to 125 mph, sudden storms, temperatures of 40 degrees Fahrenheit below zero, and oxygen deprivation. Above 25,000 feet, the air in the "Death Zone" holds only a third as much oxygen as at sea level. Even when breathing bottled oxygen, climbers experience extreme fatigue, impaired judgment and coordination, headaches, nausea, double vision, and sometimes hallucinations. Expeditions spend months acclimatizing and usually attempt Everest only in May and October, avoiding the winter snows and the summer monsoons. After Hillary and Tenzing's ascent of Everest, other records were broken, including the first ascent by a woman, the first solo ascent, the first to traverse up one route and down another, and the first descent on skis. On May 8, 1978, two Tyrolean mountaineers, Reinhold Messner and Peter Habeler, became the first to climb Everest without supplemental oxygen. On August 20, 1980, Messner again ascended Everest without oxygen, this time solo. By 1996 more than 60 men and women had reached the top without oxygen. Between 1921 and 2004, Everest has been climbed by more than 2,200 people from 20 countries. More than 185 have lost their lives, making the odds of dying during the ascent about one in eight. The dead are left where they expire because the effects of altitude make it nearly impossible to drag bodies off the mountain. In May 1996, eight climbers lost their lives in a storm on the mountain; just weeks later, there were four more deaths. In the past few years, Everest has received unprecedented media attention. Live internet reports have been sent from the mountain, using solar energy; an Imax film crew has documented a climb; and Jon Krakauer's bestselling account about an Everest ascent gone wrong, Into Thin Air, has introduced cwm, col, sirdar, short-rope, and Hillary Step into the vocabulary of mainstream America. 1924 - George Herbert Leigh Mallory (1886–1924) – English mountaineer. He took part in the first three British expeditions to Mount Everest in the early 1920s. On the third expedition, Mallory disappeared on the North-East ridge during the final stage of their attempt to make the first ascent of the world’s highest mountain. 1924 - Andrew “Sandy” Irvine (1902–1924) – English mountaineer. He took part in the third British Expedition to Mount Everest, where he disappeared on the North-East ridge along with climbing partner George Mallory. 1931, 1934, 1951 - Eric Shipton (1907–1977) – English mountaineer. In 1931, with Frank Smythe, Shipton was among the first climbers to stand on the summit of Kamet, 25,643 feet (7816 m), the highest peak climbed at that time. With Bill Tillman, Shipton was the first to penetrate Nanda Devi sanctuary. In 1951, he was a part of the expedition which discovered the route to Everest over Khumbu Glacier. 1934, 1936 – Harold William (Bill) Tilman (1898–1977) – English mountaineer and explorer. In 1934, he was the first person to penetrate the Nanda Devi sanctuary. In 1936, he made the first ascent of Nanda Devi with Noel Odell. 1936 - Noel Ewart Odell (1890–1987) – English geologist and mountaineer. He made the first ascent of Nanda Devi, which remained the highest summited peak until 1950. 1950 - Maurice Herzog (born 1919) – French mountaineer. Along with Louis Lachenal, he became the first person to summit an Eight-thousander, Annapurna, the tenth highest mountain in the world. The ascent was reconnoitered and climbed all within one season and without the use of supplemental oxygen. This peak was not climbed again until 1970. 1950 – Louis Lachenal (1921–1955) – French mountaineer. On June 3, 1950, along with Maurice Herzog, he reached the summit of Annapurna in Nepal at a height of 26,545 feet (8,091 m). 1953 - Brigadier Henry Cecil John (Baron) Hunt (1910–1998) – British military officer. He was the leader of the 1953 expedition of Mount Everest. 1953 - Sir Edmund Hillary (born 1919) - New Zealand mountaineer and explorer. On May 29, 1953, he and Tenzing Norgay (1914-1986) became the first climbers known to have reached the summit of Mount Everest. 1951, 1952, 1953 - Tom Bourdillon (1924–1956) – British mountaineer. He was a member of the British Everest expeditions on 1951, 1952, and 1953, reaching 300 feet from the summit of Mount Everest three days before Edmund Hillary and Tenzing Norgay finally conquered it. 1953, 1957 - Hermann Buhl (1924–1957) – Austrian mountaineer. In 1953, Buhl made the first ascent of Nanga Parbat, 26,658 feet (8125 m) (feat accomplished solo and without oxygen). In 1957, he made the first ascent of Broad Peak, 26,400 feet (8047 m). Buhl is the only mountaineer to have made the first ascent of an eight-thousander solo. Just a few weeks after the first ascent of Broad Peak, Buhl and Kurt Diemberger made an attempt on nearby, unclimbed Chogolisa peak in alpine style. Buhl died when he fell through a cornice on the southeast ridge near the summit of Chogolisa. His body has never been found. 1963 - Willi Unsoeld (1926–1979) - United States mountaineer. Unsoeld and Tom Hornbein were members of the first American expedition to summit Mount Everest on May 22, 1963. This climb was the first ascent of Everest from the west ridge. He had climbed Mt. Rainer over 200 times and died during an avalanche on Mount Rainier in 1979. 1970 - Sir Christian (Chris) John Storey Bonington (born 1934) – English mountaineer. He made the first ascent of Annapurna on the South Face. He was also a part of four ascents on Mount Everest (1972, 1975, 1982, 1985). 1963, 1965 - Nawang Gombu (born 1936) - Indian mountaineer. Nephew of Tenzing Norgay, Gombu was the first person to climb Everest twice, in 1963 and 1965. 1963 - Jim Whittaker (born 1929) - United States mountaineer. He is the first American to reach the summit of Mount Everest on May 1, 1963. 1980 - Reinhold Messner (born 1944) - Italian mountaineer and explorer. In 1980, Messner became the first person to ascend Mount Everest alone and without supplementary oxygen. He is also known for the being the first climber to ascend all fourteen eight-thousanders. 1982 - Nazir Sabir (born 1955) - Pakistani mountaineer. He is the only Pakistani to have climbed Mount Everest and four of the five 8,000 meter peaks in Pakistan. He is the first person to ascent two eight thousanders (Broad Peak & Gasherbrum II) in a single attempt (1982). 1987 - Jerzy Kukuczka (1948–1989) - Polish mountaineer. On September 18, 1987, he became the second man to climb all fourteen eight-thousanders. He climbed them faster than anybody else, establishing ten new routes. Several places in the Himalaya are of religious significance in Hinduism and Buddhism. In Hinduism, the Himalayas have also been personified as the god Himavat, the father of Shiva's consort, Parvati. Amarnath - has a natural Shiva linga of ice which forms for a few weeks each year. Thousands of people visit this cave during these few weeks. Badrinath - a temple dedicated to Vishnu. Deoprayag - where the Alaknanda and Bhagirathi merge to form the river Ganga. Gaumukh - the source of the Bhagirathi (and hence, by extension, the Ganga), located a few miles above the town of Gangotri. Haridwar – the place where the river Ganga enters the plains. Sri Hemkund Sahib - Sikh Gurudwara where Guru Gobind Singh supposedly meditated and achieved enlightenment in a previous incarnation. Kedarnath - where one of the 12 shrines Jyotirlingas dedicated to Lord Shiva is located. Mount Kailash - a 21,778 feet (6,638 m) high peak which is considered to be the abode of the Hindu god Shiva and is also venerated by Buddhists. Lake Manasarowar lies at the base of Mount Kailash, and is the source of the Brahmaputra. Rishikesh- has a temple of Lakshmana. Shambhala - a mystical city in Buddhism with various legends associated with it. While some legends consider it to be a real city where secret Buddhist doctrines are being preserved, other legends believe that the city does not physically exist and can only be reached in the mental realm. 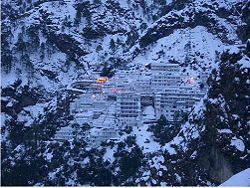 Vaishno Devi - is a popular shrine among Durga devotees. The Yeti is one of the most famous creatures in cryptozoology. It is a large primate-like creature that is supposed to live in the Himalaya. Most scientists and experts consider current evidence of the Yeti's existence unpersuasive, and the result of hoaxes, legend or misidentification of mundane creatures. The Hollywood adventure movie Vertical Limit (2000), is set in the K2 peak of the Himalayas, in Pakistan. Several levels of Tomb Raider 2 and one level in Tomb Raider: Legend of the Tomb Raider series are situated in the Himalayas. The Inheritance of Loss written by Kiran Desai is partly set in the Himalaya Mountains. It won the Man Booker Prize in 2006. Rumer Godden's novel "Black Narcissus" (1939) is about an order of nuns who set up a convent in the Himalayas. The film, released in 1947 by Powell and Pressburger and starring Deborah Kerr, was not actually shot in the Himalayas; photography relied primarily on matte paintings to evoke the mountains. 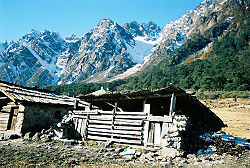 ↑ Oracle Education Foundation: Indian Himalayas. Retrieved September 16, 2007. ↑ J. Gaillardet, Lemarchand Métivier, Allégre Dupré, and Zhao Li. "Geochemistry of the Suspended Sediments of Circum-Himalayan Rivers and Weathering Budgets over the Last 50 Myrs." Geophysical Research Abstracts 5:13617 (2003) Retrieved September 16, 2007. ↑ Borgna Brunner. Mortals on Mount Olympus, "A history of climbing Mount Everest." Everest Almanac. Retrieved September 17, 2007. Anker, Conrad, Alex Lowe, Dave Bridges, Hilaree Nelson, Jeremy Nobis, Rick Armstrong, and Sting (Musician). Shishapangma, a celebration of life Himalaya, descending India. The North Face expeditions, v. 3. [United States]: North Face, 2000. Garner, Stafford, and Keith Adam. Journey into the Himalayas- The Vale of Kashmir. [Falls Church, VA.]: Landmark Films, 2005. Sakya, Sapana, and Ramyata Limbu. Daughters of Everest. San Francisco, CA: Distributed by Center for Asian American Media, 2006. Comprehensive Information about the mountains of Himalaya with links to good images (German). Geology of the Himalayan mountains. Some notes on the formation of the Himalaya. Imaging Everest, Royal Geographical Society, London. This page was last modified on 24 December 2017, at 20:54.